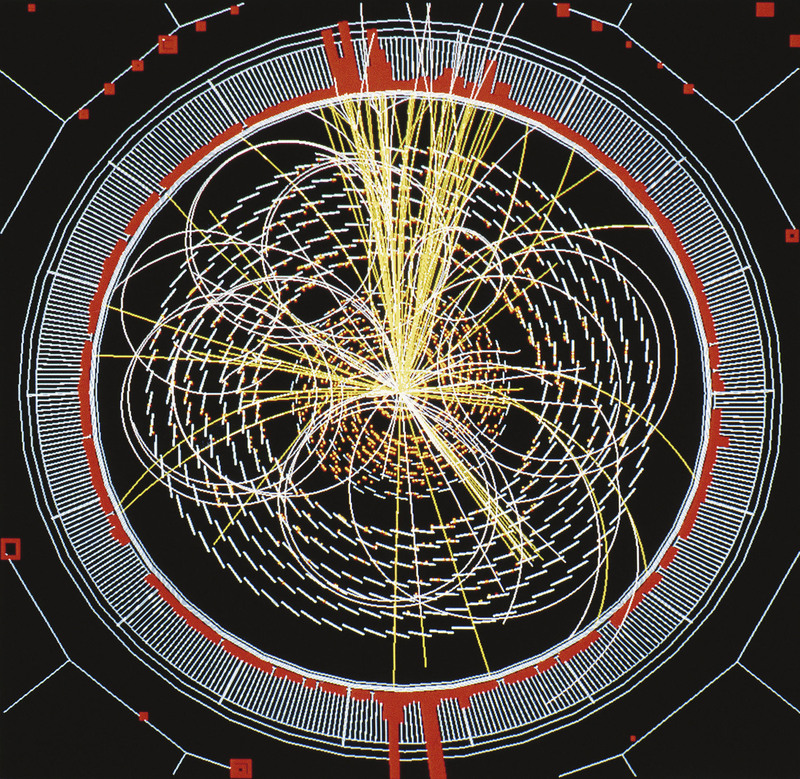 The Year Of The Higgs, And Other Tiny Advances In Science The discovery of the Higgs boson will likely be hailed as the most important scientific discovery of 2012. But many ideas that change the world don't tend to spring from flashy moments of discovery. Our view of nature — and our technology — often evolve from a sequence of more subtle advances. Scientists at the Large Hadron Collider announced the discovery of the Higgs boson on July 4, the long-sought building block of the universe. This image shows a computer-simulation of data from the collider. 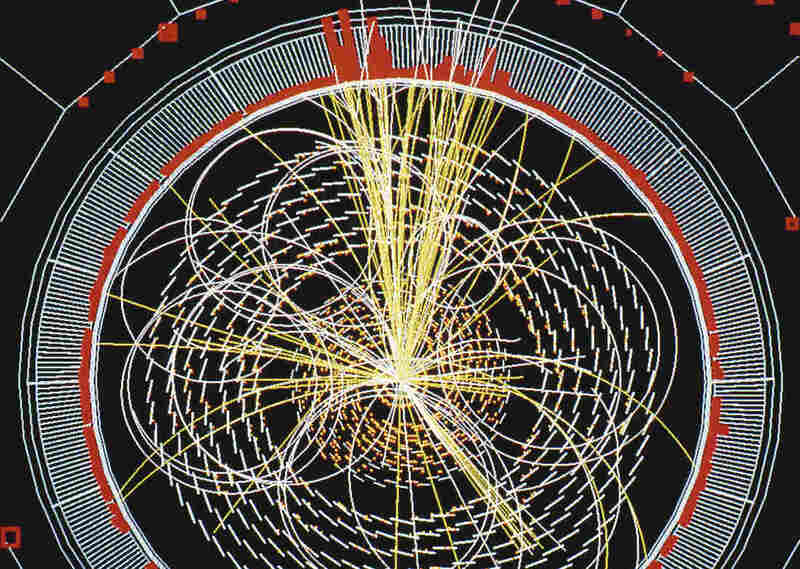 The Higgs is a long-sought building block of the universe. It finally put in an appearance at an accelerator in Europe. But though it was big news, it wasn't apparently a revolutionary discovery. "There are certainly a number of physicists who are actually disappointed," says Sam Arbesman, a scientist and mathematician at the Kauffman Foundation. "They were hoping to find something a little different from what all the models predicted." It's not necessarily true that we need to find these singular big discoveries. Because the truth is, the way we make discoveries is oftentimes based on the accumulation of a lot of smaller insights and smaller ideas and discoveries. Instead, they got a discovery that mostly assures them the universe works pretty well the way they thought it did. So big news doesn't necessarily change the way we look at the world. Arbesman and science historian W. Patrick McCray took a few minutes recently to talk about the nature of discoveries in science and technology. Each has just written a book about the process of science and technology. Arbesman's is The Half-Life of Facts; McCray's is The Visioneers. McCray, at the University of California, Santa Barbara, says revolutionary discoveries don't necessarily announce themselves when they happen. Consider this story: In 1988, a French scientist and a German scientist independently discovered a basic physics phenomenon known as giant magnetoresistance. The discovery seemed so arcane it didn't make a splash, like the Higgs boson. But, as it turns out, this phenomenon provided an extraordinarily powerful new way to get data on and off a magnetic disk, "and became the basis for a multibillion-dollar market for computer hard drives," McCray says. That fueled a technology revolution and eventually led to a Nobel Prize for the scientists. But Arbesman says even this story distorts how science often progresses. "It's not necessarily true that we need to find these singular big discoveries," he says. "Because the truth is, the way we make discoveries is oftentimes based on the accumulation of a lot of smaller insights and smaller ideas and discoveries. And oftentimes in the aggregate, those kinds of things — the things that we expect or the things that we don't expect — are often what drive science." One classic example of this is the observation that the Earth's surface is always rearranging itself, as continental plates drift around the globe. This theory, now called plate tectonics, was first proposed in 1912, "but it took decades for enough evidence to be accumulated to support the theory, and also for scientists to come around to the idea that the continents were moving," McCray says. Plate tectonics is now an indispensable way of understanding many things about our world — not just about what drives earthquakes, but how animal species came to be distributed around the planet. This kind of slow burn happens more often than you might think. "I think the laser, initially, in terms of a technology, was one of these great examples where it was a really cool thing, but I think no one had any idea what it could be used for," Arbesman says, "and now it's ubiquitous." There's a lesson in that for Arbesman. It's not so easy to figure out what fields of science to fund in order to get breakthroughs in return. "The truth is, we don't really have a good track record at predicting which ones are going to be relevant in the long term," he says. "And we want to make sure that we support the creation of knowledge. And to do that, we have to really make sure that we support everything all across the board." That means, of course, most of the time we will be supporting research that may fill in facts around the edges but won't be revolutionary. McCray argues that one of the most notable trends in science this year wasn't a discovery at all. It has to do with how much the public accepts what scientists tell them. "Debates over climate change, evolution, whether vaccines cause autism, things like that — all are part of a larger debate about the role and place of experts in American society," he says. Americans still accept that science is a way to learn truths, but people are less likely to trust scientists as objective experts, McCray says. "And I think it's certainly something that a decade from now, we might look back upon and find quite curious, and indeed, quite serious." That trend affects how we make use of the discoveries that flow from science — so it also matters a lot.